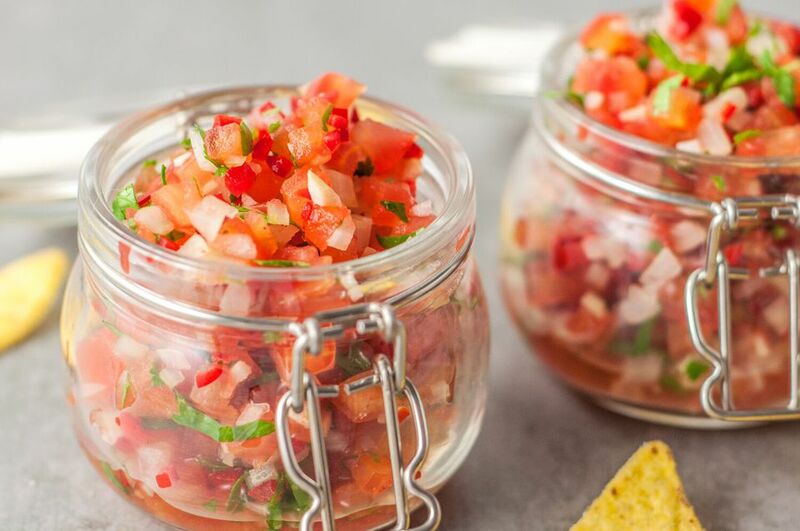 If you're looking for a fresh and flavorful salsa, this recipe is an excellent choice. The combination of diced tomatoes, peppers, garlic, and lime juice make for a classic fresh salsa. Serve it with tacos, burritos, or as a party dip with tortilla roll-ups or tortilla chips. It is a very good condiment to serve alongside grilled or baked fish fillets, grilled chicken, steaks, and pork chops. Put chopped onion and garlic in a strainer; pour 2 cups boiling water over them then let drain thoroughly. Discard the water. Allow the chopped onion and garlic to fully cool. Combine onions and garlic with chopped tomatoes, peppers, cilantro, and lime juice. Add salt and freshly ground black pepper, to taste. Use hot or mild chile peppers in the salsa. Jalapeño peppers, serrano, New Mexican, and Anaheim are good choices. Take caution when chopping the peppers and be sure to wash your hands immediately following the cutting. If you want a spicier salsa, keep some of the pepper seeds in the mixture. If you prefer a more mild salsa, make sure all the pepper seeds and ribs are removed. Plum tomatoes are an excellent choice for salsa. They are firmer and have fewer seeds, and they're easier to dice. If you store this salsa in the refrigerator for a few days, the tomatoes will continue to release their juices. Simply drain the salsa prior to serving to keep it from having too much liquid. If you're not a fan of cilantro, omit it or add fresh parsley. For extra texture and color, add about a few tablespoons of drained and rinsed black beans and a few tablespoons of cooked corn kernels. For something a little different, try a peach salsa or a tasty corn and pepper salsa.